The best ways to make money in Red Dead Redemption 2 Online. 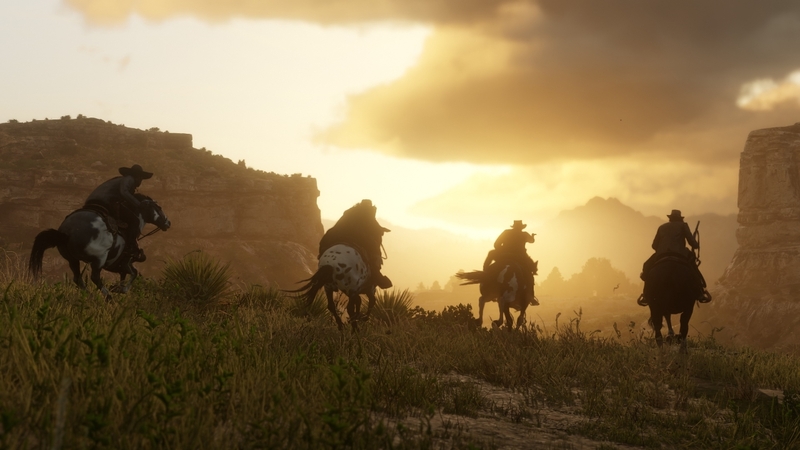 Our Red Dead Redemption 2 Online: Best ways to make money guide explains how money works in online, and lists a number of ways you can make money fast. In Red Dead Redemption 2’s online mode, making money is still crucial to keeping your cowboy/cowgirl and horse companion in good shape. You’ll need dollars to purchase provisions, outfits, weapons and, well, practically everything. Thing is, money works a little differently in Online when compared to the single player. There are actually two types of currency in Online, and methods of earning it are certainly pretty different. To help you get to grips with how money works in Online, as well as how to earn it faster, we’ve put together a guide just below. Red Dead Redemption 2 Online: How does money work? It’s worth mentioning right off the bat - remember that this is a beta. Currency earning rates are likely to change once it’s released for real. There are two different currencies which you’ll earn at different rates. One being Gold, and the other being Dollars. You’ll earn Gold at a pretty slow rate in Red Dead 2 Online and that’s because it’s the “premium” currency, so to speak. It’s the one you’ll use to purchase cosmetic items which don’t offer any gameplay advantage, but make your character stand out. We’re talking exclusive hats, outfits and the like. It’s safe to say that Gold is designed to be a grind to obtain and there are only two ways to get your mitts on a tonne of it: play for thousands of hours, or purchase it with real money when the Online store eventually goes live. This is standard currency that you’ll earn steadily as you play Red Dead 2 Online. It’s used to purchase practically everything from the catalogue, camp upgrades, ammo, provisions and more. Despite the fact that a steady stream of dollars will be dropping into your satchel as you play, it’s a painfully slow earning rate in comparison to the single player. Completing missions and looting enemies in the single player can earn you a nice wad, but in Online you’ll earn a pittance. General items like provisions aren’t expensive, but start browsing for weapons or new threads and you’ll soon realise they’ve got the potential to clean out your bank account. Currently, life in Online is expensive and money is pretty hard to come by. Below we’ve listed all the ways you can start racking up the dollars. Don’t expect a sudden influx of boundless cash, but doing these methods should net you more than usual. We’d highly recommend tackling story missions as they can reward you with a lump sum of cash. Complete the optional requirements and you’ll earn a little more for your efforts too. It goes without saying that looting anyone or anything you’ve murdered is worthwhile. Even if you’re not pocketing a huge amount, every little helps! This combines nicely with the tip above, as you’ll likely cram your inventory with jewelry, buckles and other stolen goods. Just like single player, you can head on over to most major towns and cities, and sell these items for some extra cash. Dotted around the map are little orange icons that represent stranger missions. These are usually simpler than their story counterparts, but can still yield a nice cash injection. For one mission we had to transport a couple of bags to strangers dotted around the map. It took us all of five minutes and we earned a fair few dollars for our efforts - nice. You can always play a few games of PVP alone or with friends to earn some more money. Rates vary, but it’s fun to break into some quick deathmatch action every now and again. There are bandit camps scattered around the map which you can clear out. Once you’ve dispatched the fodder, a leader will normally emerge and you can choose to spare or kill them for a treasure map. These treasure maps aren’t nearly as complex as those found in singleplayer. A marker will be placed on your map, and it’s a case of heading over to it, cracking open the treasure chest and admiring your spoils. You can nab up to around $200 if you’re lucky, so it’s a great way of stacking those dollars fast. This video by Arekkz Gaming is well worth a watch as it gives a few tips on how to make money early on in Red Dead Redemption 2 Online.